A Polish court has sentenced two Russian citizens to three and two months behind bars respectively for taking part in a brawl with Polish football fans before the Euro 2012 match between Russia and Poland on Tuesday. ­Court spokesman Wojciech Malek told Itar-Tass on Thursday that the two will serve their sentences in Poland. 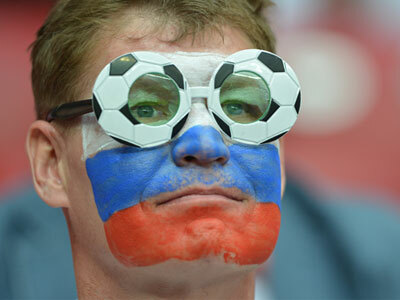 The Prague District Court in Warsaw also says that it is currently reviewing a case of another Russian football fan, who threw a petard on the field during the match. 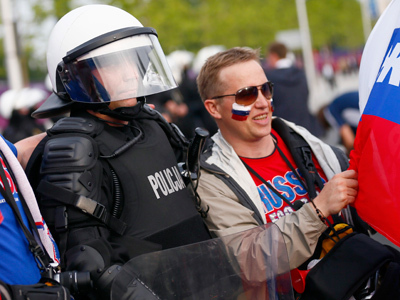 The clashes erupted in Poland’s capital Warsaw on Tuesday, when Russian football fans held a march there to celebrate Russia Day (formerly, Independence Day) ahead of the Euro 2012 match between Russia’s and Poland’s national teams. 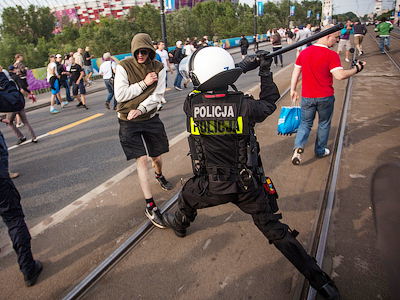 The group, surrounded by members of the Polish police, was crossing the Poniatowski Bridge on its way to the stadium when it was attacked by Polish hooligans who had their faces masked. Two Polish football hooligans have also received jail sentences following mass arrests. One of them was sentenced to three months' and another to five months' imprisonment. Twenty-one more Poles who provoked the brawl and were later arrested have also heard their verdicts. The court spokesman said the charges for those convicted include assaulting police officers and "taking part in illegal gatherings." The Tuesday brawls left dozens of civilians and 17 police officers injured. Some 25 Russians sought medical assistance, and one of them remains in a hospital. 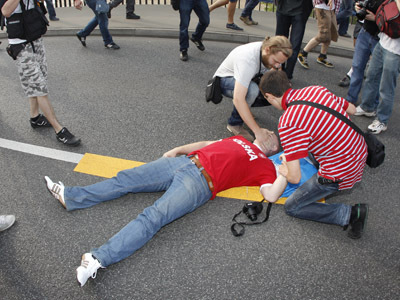 Warsaw police eventually arrested 156 Polish fans, 25 Russians, a Spaniard, a Hungarian and an Algerian.